When we refer to the "colored ranking charts", we're talking specifically about the charts with the colored vertical bars indicating the number of your keywords that rank in the top 100 results. Essentially, these charts display the total number of your tracked keywords which are ranking within various numerical ranges in the SERPs. Each bar represents a graphical display of your total top 100 rankings for a particular date. The date in question is given at the bottom of each colored column. The graph scale is on the left hand side. So as you can see, the largest dark green bar graphically represents the 35 keywords in positions 1-3 in the SERPs, the light green represents the 5 keywords in positions 4-10 and so on. Note that the number of keywords counted as ranking in those positions ONLY refer to keywords which you're tracking within the AgencyAnalytics dashboard. Your site may very well rank for other keywords out there in cyberspace, but we can ONLY track keywords which you've explicitly entered into your Rankings dashboard for keyword monitoring. 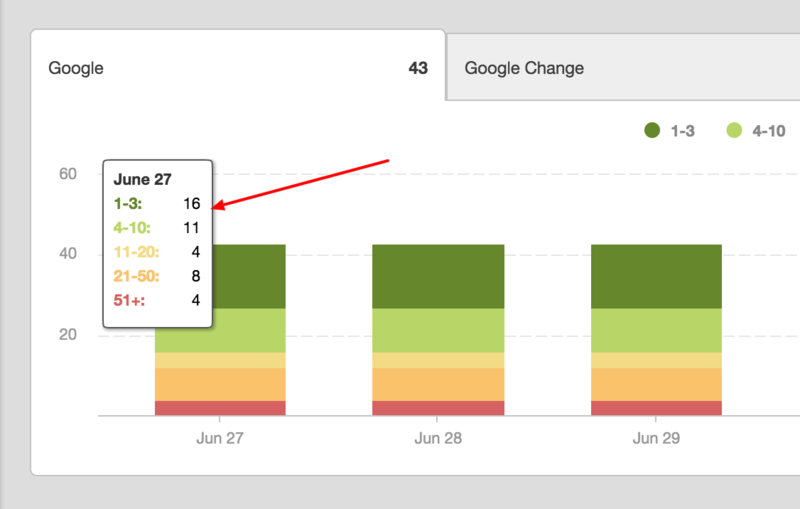 Why are some of my SERP changes not reflected on the graph on the main rankings page of the dashboard?